Africa is one of the most fascinating continents on the planet and you will find wildlife here that you will find nowhere else in the world so we thought we would take a look at the Stampede slot by Eyecon. This is a popular game that focuses on African wildlife and there are some excellent bonus features and jackpots to play for. Players will be able to roam the plains of the Serengeti and uncover some wild prizes so read our review for all the facts. The return to the player for this game is pretty high at just over 95% and any malfunction will void all pays and plays. The aim of the game is to spin the reels to complete winning combinations and there are a total of 25 paylines on Stampede so plenty of ways to pick up those wins. There are bonus features to consider as well and we will explain these later on in the review. If you pick up a win then you will receive a prize based on your original bet and any multiplier that comes into play. Players can bet from just 25p and the maximum bet on Stampede is £50 so choosing a betting strategy is a good place to begin. Try and find a betting strategy that fits in with your budget but still allows you to enjoy plenty of spins. Betting big may allow to pick up bigger prizes but smaller wagers will allow you to play the game for longer so it really is about trying to find a balance. There are a couple of bonus rounds to enjoy on Stampede that can help you top up your balance when they trigger. They are activated in a number of ways and perhaps the first thing you might encounter is the wild symbol. On Stampede, the wild symbol is the Sun symbol which replaces all others except the scatter symbol which is the Elephant. The Elephant scatter is the key to free spins and all you have to do is land 3 of them during any spin to activate the free spins. There are up to 20 on offer and players can also benefits from various multipliers too. Finally, we have the gamble feature which allows players to gamble their latest win for the chance to double their money. This is a high risk game so take care when using it. The orange grassy plains form the backdrop and make for a really exciting atmosphere and there are a number of interesting animals on the reels to interact with. There are rhinos, buffalos, cheetahs, lions and much more. The lower-value symbols are letters and numbers in various colours and the sound effects are ok although you can turn them off if you wish. 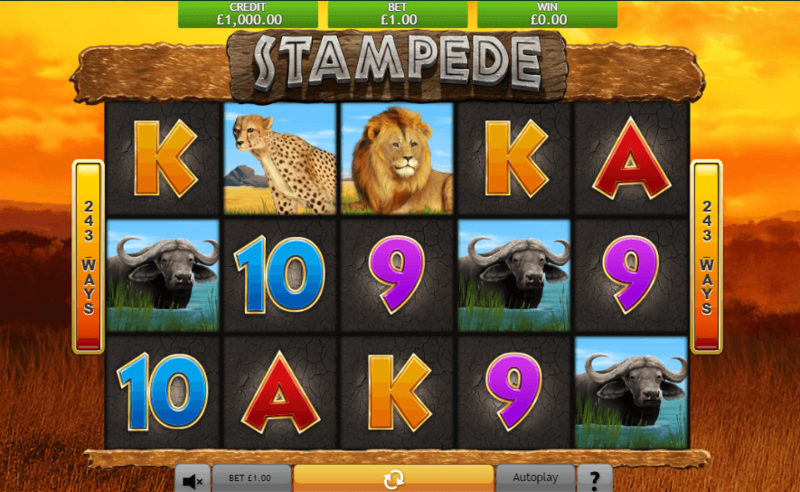 Stampede is a bright and colourful slot that has plenty of excellent features to enjoy. We really enjoyed playing it and there are plenty of free spins to win as well. Definitely, check it out if you like outdoor slots and remember that you spin from just 25p which is great.